Kansas City is filled with incredible stadiums and concert venues that offer amazing events for its residents. With numerous entertainment events scheduled every year, thousands and thousands of guests expect a certain level of safety when attending occasions of this size. Stadiums and concert venues require high-security measures that address all possible threats that could happen at any time. Since these large commercial properties can actually be targeted by assailants, additional measures must be taken to ensure safety. Window film delivers exclusive security benefits that can really improve general safety. Security film mitigates broken glass hazards which is actually the leading cause for significant injury as well as blast-related death. Security film provides extensive protection in an event of a break-in, burglary, natural disaster, freak accident, and more. Since more extreme threats are possible for properties of this type, specialty security film can also be considered. Bomb blast protection window film delivers better resistance towards high impact events like explosions. The shockwave of an explosion is better absorbed through this specialty security film, keeping broken glass within the window frame. Ballistic resistant window film is also available for defending against gunfire. While bulletproof glass doesn’t exist quite yet, this is the closest thing available for gunshot protection. 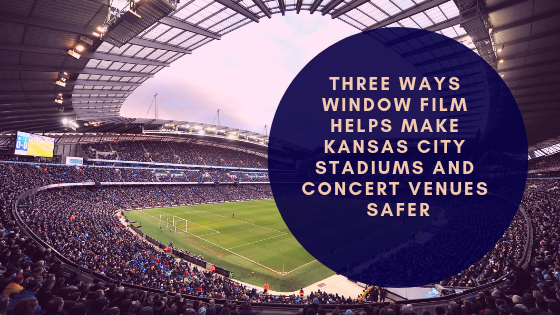 Scottish Window Tinting has helped countless stadiums and concert venues with their safety efforts. We’re happy to conduct on-site assessments in order to provide detailed security reports on building vulnerabilities, high-risk areas, product recommendations, and much more. Work directly with our security experts to really understand the best course of action for your property and ways to reduce the risk of injury. For more information regarding security film for your Kansas City stadium or concert venue, please contact us!